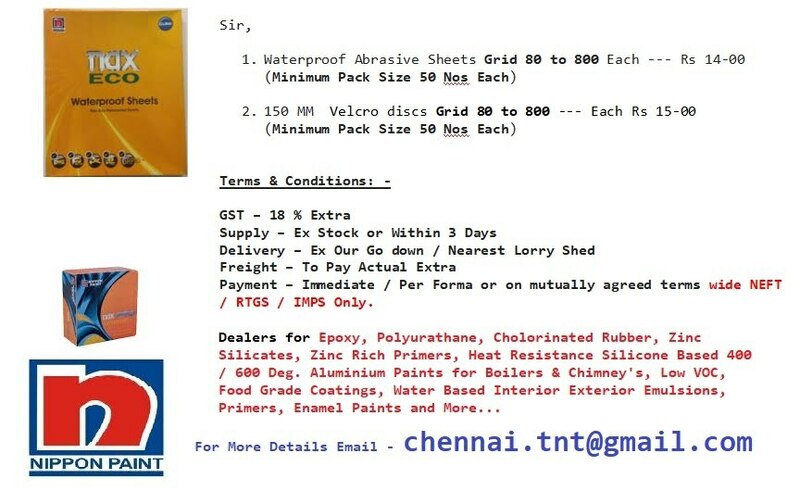 Tamilnad Traders Tamilnad Traders are authorized dealers, Whole sellers and project suppliers of leading Paints Manufactures, Welding Electrodes, and Their Consumables, Namely Shalimar Paints, Berger Paints, Asian Paints, Aspa Automotive Re Finishes, Nippon Paints, MRF Paints, Snowcem Paints, Indigo Paints, Esab Welding Electrodes & their Consumables, and More. Our Product Meet the various maintenance, anti corrosive, Floor, Protective Coating requirements of Structural Industries, Power Plants, Refineries, Off Shore Installations, Fertilizer Industries, Petro Chemical Plants, Defense, Sugar, and Textile Industries. 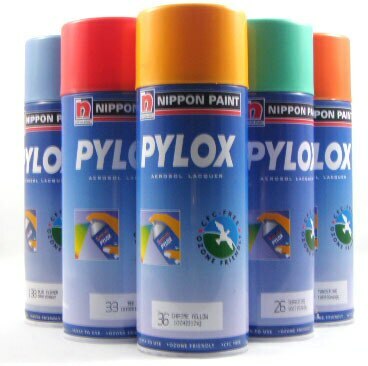 We Offer Assured Quality, Charge Nominal Delivery Charges, and Provide Test Certificates / MSDS details for the supplies. 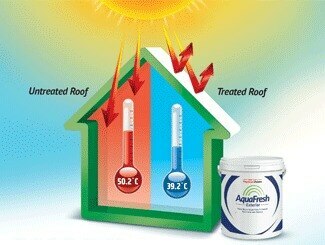 Silicon Based Heat Resistant Aluminium Paint to with stand temp upto 600 Degrees. 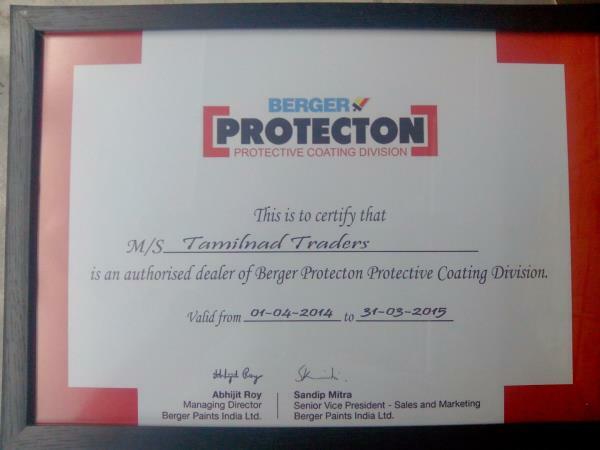 Tamilnad Traders are authorized dealers, Whole sellers and project suppliers of leading Paints Manufactures, Welding Electrodes, and Their Consumables, Namely Shalimar Paints, Berger Paints, Asian Paints, Aspa Automotive Re Finishes, Nippon Paints, MRF Paints, Snowcem Paints, Indigo Paints, Esab Welding Electrodes & their Consumables, and More. Our Product Meet the various maintenance, anti corrosive, Floor, Protective Coating requirements of Structural Industries, Power Plants, Refineries, Off Shore Installations, Fertilizer Industries, Petro Chemical Plants, Defense, Sugar, and Textile Industries. 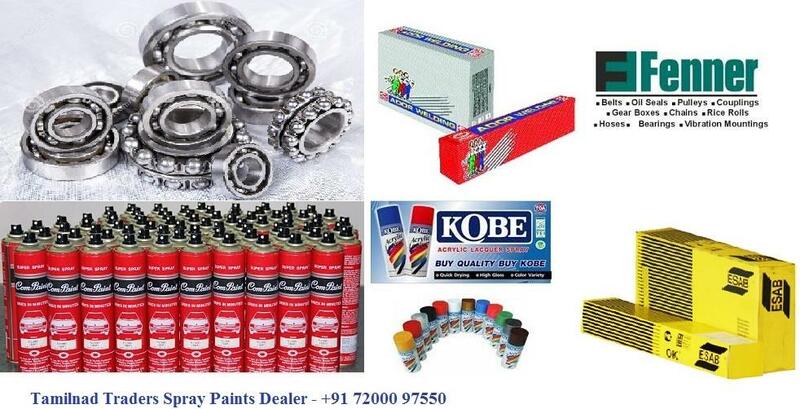 We Offer Assured Quality, Charge Nominal Delivery Charges, and Provide Test Certificates / MSDS details for the supplies.